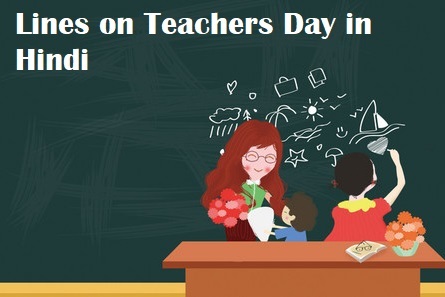 In this article, we are providing 10 Lines on Teachers Day in Hindi & English. In this few / some lines on Teachers Day, you will get information about Teachers Day in Hindi. हिंदी में शिक्षक दिवस पर 10 लाइनें, Short Essay on Teachers Day. 1. Teachers Day is celebrated on 5th September every year in India. 2. Teachers Day is celebrated every year on the birthday of Radhakrishnan, the second President of India. 3. Teachers day celebrating different days around the world..
4. There is a holiday in some places on this day and a special event is organized. 5. On the day of teachers day, children also give gifts in honour of teachers. 6. From 4 to 5 October, it is celebrated as International Teacher’s Day. 7. On the day of the teacher’s day, everybody tries to please his guru in various ways. 8. Some great teachers are also honored by the government on Teachers Day. 9. On Teachers’ Day, children write special messages for teachers. 10. Teachers get great respect and affection on this day.